Our paper evaluates a long-standing debate and examines whether the prehistoric population of Rapa Nui experienced a significant demographic collapse prior to European contact in AD 1722. We have used dates from hydrated obsidian artifacts recovered from habitation sites as a proxy for land use over time. The analysis suggests region-specific dynamics that include the abandonment of leeward and interior locations. These temporal land-use patterns correlate with rainfall variation and soil quality. This analysis demonstrates that the concept of “collapse” is a misleading characterization of prehistoric human population dynamics. As a result, we see our approach as useful in the study of other prehistoric societies for which a sudden demographic collapse has been proposed in prehistory. There is ongoing debate about the demographic trajectory of Rapa Nui (or Easter Island) from its settlement around AD 1200 (1⇓⇓–4) until the arrival of Jesuit missionaries in the 1860s (Fig. 1) (5). The central issue is whether the Rapa Nui population experienced significant demographic decline before European contact in AD 1722. 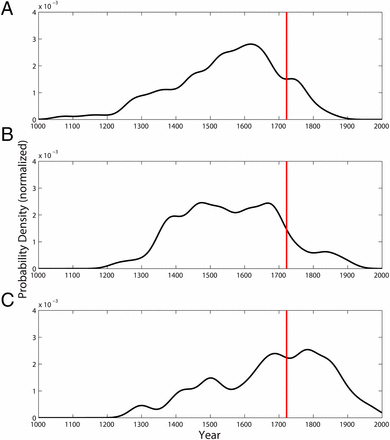 Proponents of this “pre-contact collapse” scenario suggest that environmental degradation reduced food production, and a number of researchers have elaborated a chronological model (6) that argues for a period of warfare, population reduction, and political fragmentation in the AD 1500s (7⇓⇓⇓⇓⇓–13) or late AD 1600s (14⇓–16). Alternately, other researchers view the archaeological evidence as favoring socio-political continuity until Western smallpox, syphilis, and tuberculosis pathogens decimated the population after European contact (17⇓⇓⇓⇓–22). A map of Rapa Nui showing the three study areas (pink squares) and locations mentioned in the text. Rainfall isohyets demonstrate the rain shadow effect. Note that the area in the northwest of the island appears to be quite dry, as does the area immediately west of Poike, the peninsula on the extreme east of the island. Both these areas are, in fact, drier than elevation alone would predict. Solid purple dots represent field weather stations. The red dot represents the weather station at the Mataveri airport. There is archaeological evidence for societal change on Rapa Nui, including the manufacture of obsidian spear points, the destruction of elite dwellings, habitation in refuge caves, cannibalism, a change in burial practice, and a marked ideological shift away from ceremonial platform (ahu) structures to the formation of the Birdman (tangata manu) cult centered at Orongo (see ref. 23 for a summary). These changes have been associated with the abandonment of inland field systems and houses and decreased population levels (14⇓–16, 24). The question is when these changes occurred. Poor chronological control over the timing of past events in all these cases makes it difficult to draw firm conclusions as to whether these changes occurred before or after European contact. Oral histories recorded in the early 20th century by Routledge (25) reflect a period of precontact societal upheaval but are shrouded in mythology. Empirical evidence for societal collapse, extensive environmental degradation (other than deforestation), or warfare that could have caused such a collapse before European contact is minimal (20). A recent analysis of radiocarbon dates from throughout Rapa Nui noted the inherent (and severe) ambiguities in radiocarbon calibrations in the time period of interest but concluded that there was demographic continuity into the postcontact era as opposed to population decline during the late precontact period (19). Additional analysis of 14C and obsidian hydration dates from a smaller study region in Hanga Ho‘onu on the northeast coast also reported continuity of settlement and agricultural activity into the period of European contact (18). For environmental degradation, there is substantial evidence for deforestation (26⇓⇓⇓–30) but its timing and causes have been debated (2, 31⇓⇓–34). Soil erosion occurred in limited areas (i.e., on the older Poike peninsula (35⇓–37), along a small section of the northwest coast, and on the slopes of some of the smaller volcanic cones); however, there is no evidence of widespread soil erosion that could have interfered with agricultural production (38). The assertion that the proliferation of obsidian spear points is an indicator of endemic violence is challenged by lithic use-wear analysis that shows the artifacts to be used extensively in processing vegetation (39, 40). Here we identify spatial and temporal variation in the intensity of land use across portions of Rapa Nui and relate these observations to new data on spatial variation in climate and soil fertility. We base our analysis of land use on obsidian hydration dating (OHD) of tools and flakes, using 428 obsidian hydration dates developed under revised calibrations and protocols (SI Appendix, Table S1) (41, 42). Obsidian nodules were fashioned into everyday working tools and are plentiful at many archaeological sites. We use the quantity of hydration dates as a measure of the amount of discarded material over time and as a proxy for land-use intensity. The island of Rapa Nui was created by multiple volcanic events (43). Early eruptions formed the spatially separate Poike (0.78–0.36 Mya), Rano Kau (0.78–0.34 Mya), and Maunga Terevaka (0.77–0.30 Mya) volcanos. Between 0.24–0.11 Mya additional eruptions from M. Terevaka joined the three land masses and formed the land surface upon which ancient agriculture was later practiced. M. Terevaka reaches a height of 505 m, with annual rainfall increasing with elevation. However, there is a well-defined rain shadow on the northwest coast in the area known as Te Niu (Fig. 1). Our recent recording and analysis of climatic data (Table 1 and see SI Appendix, Table S3) suggests that rainfall ranges from ca. 2,100 mm/y at the top of M. Terevaka to a low of ca. 630 mm/y along the coast in the rain shadow. Analysis of modern rainfall data from 1958–1997 shows considerable year-to-year variation, with droughts occurring (17). Our climatic data show that near-surface annual soil temperatures also are elevation dependent and average 22–24 °C on the coastal plain and 19 °C just below the summit of M. Terevaka (SI Appendix, Fig. S1 and Table S2). Soil properties related to soil fertility vary substantially across Rapa Nui, reflecting variation in climate, age of the volcanic substrate, and topography (44, 45). 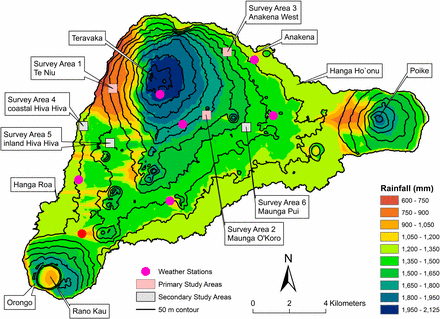 Differential rainfall has caused substantial variation in Rapa Nui soil nutrients, as it does in volcanic substrates of similar age in Hawai‘i (46, 47), and older substrates generally are depleted in soil nutrients compared with younger ones. Although soils of the lowland areas with moderate rainfall are richer in biologically available nutrients than are wetter, higher elevation soils (45), all but the richest Rapa Nui soils are nutrient depleted in comparison with the soils where precontact Hawaiian farmers intensified agricultural production (48). On Rapa Nui, the primary cultigens were sweet potato (Ipomoea batatas), dryland taro (Colocasia esculenta), yam (Dioscorea spp. ), and ti (Cordyline) (49), of which sweet potato was perhaps a secondary introduction (50). Within several centuries after settlement, beginning about AD 1400, these crops became intensively cultivated in lithic mulch gardens (49, 51). Recent analysis of modern rainfall data documents periodic droughts, and if similar conditions existed earlier in time (52), such climatic events would have affected crop production, with taro being most vulnerable and sweet potato being more resilient to the parameters of the island’s fluctuating rainfall (17). We evaluated region-specific land-use patterns in six study areas on Rapa Nui, focusing on three for which we have information on climate, soils, and land-use trends derived from numerous obsidian hydration dates (Fig. 1 and Table 1). The three intensive study areas were situated to sample diverse environmental settings. Study Area 1 (SA1) is located near the northwest coast at a low-rainfall site in the rain shadow of M. Terevaka. SA2 is located in the interior on the slopes of M. Terevaka at a distance of more than 4 km from the southern coast and is a higher-elevation, high-rainfall location. SA3 is located just inland on the northeast coast, west of Anakena beach. SA1 has relatively high soil nutrient availability as indexed by plant-available phosphorus, calcium, and base saturation but low rainfall; SA2 has the lowest nutrient supply and highest rainfall; and SA3 is characterized by intermediate amounts of rainfall and relatively high soil nutrient levels (Table 1). The other three regions that we sampled on Rapa Nui are located in Fig. 1, and their properties are summarized in SI Appendix, Table S3. OHD produces results that consist of a mean date with an SE of 30 y for each dateable object. (These dating outcomes, the details of their calculation, and the sampling procedures are described in the SI Appendix and refs. 41 and 42) The normally distributed individual-object probability distributions were combined to generate summed probability distributions (SPDs) for each study area, a method used by archaeologists to analyze radiocarbon dates from Rapa Nui (19) and elsewhere (see refs. 53 and 54 for reviews). Given a series of mean OHD dates with SEs, we derived a distribution by summing the fractions of date probability in any given year to get a measure of the equivalent number of dates, or density, assigned to that year. The summed probability fractions that form the curve indicate the periods when the obsidian artifacts most likely were created and, by proxy, the intensity of land use in different regions of the island from the first occupation until after European contact. Fig. 2 shows the OHD SPD curves for the three primary study areas. OHD normalized SPD curves for SA1 (A), SA2 (B), and SA3 (C). The red line identifies the year AD 1722, the date of first European contact. The SPD curves cannot pinpoint events in history because a single flake in the dataset represents a range of probabilities for its exposure date, so its effect on the SPD curve is felt both before and after its true date of creation. Therefore, an environmental or social change that alters flake production in a given year will affect the SPD on either side of that year, with diminishing intensity in years farther away from (much earlier or later than) the true year of the event. This uncertainty tends to blur the relationship between changes in actual rates of tool production and the characteristics of an SPD curve. To determine the point at which OHD samples actually began to decline, we used a curve-fitting method and compared the observed OHD SPDs with hypothetical distributions derived from land-use intensities and determined the best fits. These hypothetical trajectories were created by varying four parameters describing patterns of land-use change across a range of possibilities: (i) the rate of exponential growth in the production of datable obsidian before a decline (from 0.002 to 0.01 in increments of 0.002), (ii) the length of the plateau at which their production remains at its maximum (using 0, 25, 50, and 200 y), (iii) the year in which the creation of datable obsidian begins to decline from its maximum (from AD 1600–1850 in 5-y increments), and (iv) the constant exponential rate at which the creation of datable obsidian declines (from 0.002–0.1 in 0.002 increments and from 0.15–0.5 in 0.05 increments). These 59,160 hypothetical trajectories that depict a range of scenarios of obsidian discard were converted to OHD SPDs. We scaled these hypothetical SPDs to the maximum (after AD 1600) of each of the observed SPDs and found the best fit between models and observations using a least-squares method. The best fit was determined using three windows of comparison by minimizing the sum of the squared error across the spans of ±25, 50, and 75 y around the peak of the observed SPD. We focus on the ±50-y analytical window; the data for the other analytical windows are presented in SI Appendix, Fig. S2 and Table S4. This process yields a single estimate of the most likely date of the initiation of land-use decline in each study area. To assess the robustness of the findings, we bootstrapped (resampled with replacement) the distributions of mean OHD dates in each study area 2,500 times. By repeating the best-fit methodology using the resampled observed OHD SPDs, we determined distributions of dates of commencement of significant declines in the production of datable obsidian in each study area. Fig. 3 displays the histograms of the most likely year of decline commencement from the 2,500 bootstrap-and-fit iterations. 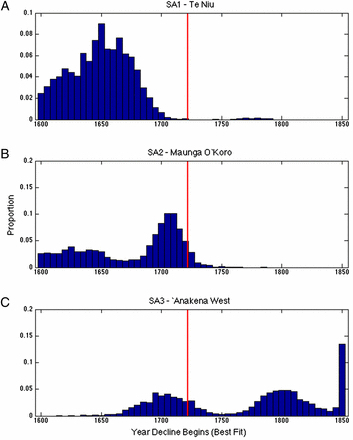 The most likely date for the initiation of land-use decline in SA1 (A), SA2 (B), and SA3 (C). These normalized results are based on 2,500 bootstrap iterations of the OHD data at each study area. The red line identifies the year AD 1722, the date of first European contact. Our approach provides a robust means of determining when regions of the island were occupied and used and when the initial period of decline after AD 1600 began, including quantification of the uncertainty associated with these results. The degree of dispersion of best-fit years is a function of OHD sample size. Greater sample size would be expected to reduce the variability across the bootstrapped datasets and thus provide a more precise estimate of the actual point at which land-use decline begins by reducing the risk of small-pool sampling errors. This information on land-use change is related directly to regional food production, although differential behavioral strategies (e.g., horticultural, residential, and religious activities) in different study areas would influence the strength of the correlation. Changes in land use also should be connected to regional population, although that connection could be modulated further by differential behaviors. The OHD SPD curve for SA1 near the coast on the northwest of the island indicates a steady increase in the intensity of land use from ca. AD 1220 to AD 1650 (Fig. 2A). The curve suggests land use peaked around AD 1650 and dropped rapidly thereafter. The best-fit curve methodology indicates that the most likely date for the initiation of land-use decline was ca. AD 1660, well before European contact in AD 1722 (Fig. 3A). Only 0.64% of iterations resulted in the decline beginning after AD 1720. In the interior study area (SA2), land use initiated after AD 1200 with a rapid increase through the AD 1300s and a lower rate of increase until ca. AD 1480 (Fig. 2B). From that time land use remained relativity constant at a high level until the end of the AD 1600s. The best-fit curve methodology suggests that the most likely date of initial decline in the region was ca. AD 1705 or 1710 (Fig. 3B), indicating reduced intensity of use of upland regions just before European arrival on Rapa Nui. Of 2,500 iterations, 5.00% resulted in the decline beginning after AD 1720. In contrast to SA1 and SA2, in the near coastal northeastern study area (SA3) land use increased at a relatively slower rate from ca. AD 1240 to ca. AD 1500, with a steeper increase during the AD 1600s to an initial peak around AD 1690 (Fig. 2C). From that time on there seems to be relatively constant land use untilca. AD 1800. The best-fit curve methodology suggests the most likely date for the initiation of land-use decline was ca. AD 1850 or later, well after European contact (Fig. 3C). We found 67.2% of iterations with a best-fit year of decline commencement after AD 1720. There is strong evidence for a decrease in the intensity of land use before European contact in two of the three primary study areas—the dry area of SA1 and the wet and infertile area of SA2. By the time of European contact, land use in both areas had declined by almost half. SA1 was at 53.7% of its AD 1618 maximum, and SA2 was at 60% of the post-AD 1600 maximum, which occurred in AD 1667. In the dry area of SA1 annual rainfall (ca. 805 mm) is close to the annual rainfall of 750 mm/y that has been identified as the lower boundary at which Hawaiian cultivators developed intensive dryland systems (46). We suggest that this area would have been highly vulnerable to periodic droughts and therefore would have been one of the earliest areas to be abandoned. In contrast, the central, upland portion of Rapa Nui (SA2 and surrounds) is wet but strikingly low in soil fertility in comparison with the lowlands of Rapa Nui (43). We suggest that cultivation of these poor soils could be sustained only through long-fallow shifting cultivation, and that attempting to farm the area with a shorter fallow cycle would have degraded the already very low fertility of this area. In contrast, SA3 represents a region with adequate rainfall and relatively fertile soils (Table 1). In this area, land use was relatively high during the late AD 1600s until after AD 1800. The individual OHD SPD curves of the three secondary study areas (SA4–6) yield less definitive temporal patterning (SI Appendix, Fig. S3) with lower confidence because of less intensive OHD sampling. Our information demonstrates that some regions of Rapa Nui experienced declines in the intensity of land use before European contact. If that decrease in land use and associated food production was not offset by increased food production elsewhere on the island, then the results are consistent with a decrease in overall food supply before European contact. Information on population and soil fertility from more regions of Rapa Nui would be valuable, of course, but regional total food production could have declined (and influenced the dynamics of precontact society) with sustained production through European contact in some areas of the island. New chronometric evidence from three study areas reveals spatial and temporal variation in Rapa Nui land use. Initial settlement and expansion occurred from ca. AD 1200, with the rapid development of the interior for agricultural activities beginning in the early AD 1300s. Reductions in the intensity of land use before European contact in the dry northwest section of Rapa Nui and the region of nutrient-leached soils in upland areas would have contributed to increasing land pressure in other parts of the island and may have led to periods of conflict as land use was renegotiated. This temporal reconstruction of land-use history associated with food production argues against the notion of an island-wide precontact collapse as a useful explanatory concept for Rapa Nui—although it does support the reality of a precontact decline in land use that probably was associated with declines in food production. These results indicate that island-wide landscape use was modulated by an underlying climatic and biogeochemical matrix as well as by response to dynamic variations in climatic and biogeochemical factors. We propose that precontact declines in the intensity of land use (and presumably population) in dry and infertile regions of Rapa Nui better reflect a framework of environmental constraint than of environmental degradation—although constraint and degradation can intergrade, as in the case of infertile soils that are suitable for shifting cultivation being degraded through overuse.